There are benefits and “not” benefits that come with a 30-year career. The “not” benefits include: not being able to read a mechanical drawing or an electrical schematic without glasses, the tendency to forget that with a GoPro camera I don’t need to spend $20K on a monitoring video system, and (regretfully) my ever-expanding waist line. But on the other hand, I've clocked over 50,000 hours working in a specialized engineering area and if it is true that a 10,000-hour study makes an expert in any particular subject, then I’m an expert 5 times over! In one of my previous articles, I wrote about the benefits of keeping an open career track for engineers, who rather than becoming managers, elect to stay in the technical field. I believe that strategy shows a lot of foresight, but there is a dark side to this as well. What might that be? Read on! When I first started working in Sensor Instrumentation, we had a couple of “experts” in our group (who at the time seemed “ancient” to me…but in reality were probably younger than I am today). We had the luxury of being fully staffed and we were able to have the “grey beards” assigned to special projects (or be called in as Special Forces when needed). Because of their experience they were focused on documenting current “best engineering practices” employed by our group, and developing specifications for new and more efficient process for doing business. That last function, the new and more efficient process, was probably one of their most important assignments. We always functioned in an environment of fluctuating budgets and even though the staff levels were high when I got hired, everyone expected (and eventually saw) reductions in personnel, but not in the work load expected from the group. We all knew that during this “happy” time, we had to learn how to do more with less. It made sense to assign this project to the folks who have done the job and have been around long enough to know all the different aspects of what doing the job required. Right? The early 1990s was an exciting time to follow the steep curve of technology development: 24-bit analog to digital converters started becoming affordable, miniaturization allowed the manufacture of pressure measurement systems that comprised hundreds of channels, and more and more manufacturers of different measurements systems were adapting a standard interface to create systems eliminating timing issues. Regretfully, it just so happened, the particular character make-up of the two experts in our organization was such that they were not excited about the advances of the technology that could have made us more efficient at our jobs. They were convinced that the reason why they got to the current apex of their careers was their use of proven technology (that they were very comfortable using, because they knew it “inside and out”), and they wanted to stay as “conservative” as they could. I remember being extremely frustrated because just about every new system, which the young engineers would bring to the attention of our experts, would be rejected. Sometimes I could follow their reasoning: some of the technologies that we brought to their attention were new and as of yet not developed enough. I remember when one of my fellow engineers found a 32-channel thermocouple temperature system, small enough to be installed into the test article, that accepted thermocouple inputs (which were made of a special type of conductors), converted them to voltage, digitized the voltage, converted the voltage to temperature, and sent all 32 channels down to the control room (120 feet away) on IEEE interface. It was definitely better than running 120 feet of 32 pairs of thermocouple wire between the model and the control room! The proposal for integration into our system was rejected because the system was not developed to withstand the environmental requirements (vibration, oil contaminated atmosphere, and high temperatures that could sometimes occur in non-ventilated test articles). OK, I get that, but it seemed unreasonable to me that the proposal was rejected out of hand without some further investigation of possibilities of working with the manufacturer to make improvements. This was in sharp contrast to what I was experiencing in the comic book world around the same time. 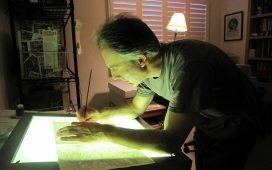 One of my art mentors, Frank Cirocco, saw that as the printing industry started shifting into digital, more and more tools became available for artists to create digital artwork. One of the biggest advantages of digital artwork, apart from the fact that it is right away “ready for press,” is that as editors change their minds and ask for small tweaks, there is no need to re-draw anything. All changes and patches can be made in minutes, instead of days. So while most artists (who were half Frank’s age) complained about the shift to digital and talked about how they would never switch to creating digital art because they enjoyed the tactile feeling of paper and paints (valid points, but not healthy in the realm of commercial illustration where schedule rules), Frank made the investment by purchasing a Mac, a scanner, a printer, and a copy of Photoshop (yeah, you used to be able to buy PS on a disk). Three years later, his business went from one employee to nine, and the work that his studio was turning out was fantastic. Sure, the quality of the work depended a lot on Frank’s skills as an artist and an art director (after all, he was an expert in his field! ), mentoring his employees on how to approach their assignments, but his success also in no small part depended on his willingness to embrace new ideas. 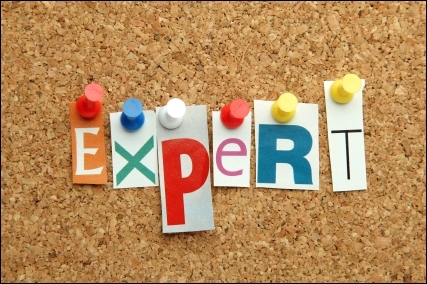 What I learned back than was this: there are experts, and then there are EXPERTS. Clocking time on the job could make someone really good at their job…in a very narrow capacity. The real experts are those folks who, knowing what they know, are willing to take a step out of their comfort zone of doing business the usual way, keeping an open mind to use their understanding to look at what is familiar from a different perspective. Once in a while I am asked to either evaluate a new proposal or maybe help in putting together specifications for a new system. I always try to be just as excited as the new engineers who are leading the effort. I always try to understand what their motivations are and what they see as the important aspects of the new proposal. Then I try to share some of my experiences, and discuss approaches that worked and didn’t work in the past (if I can remember them). I don’t try to “teach history,”instead I want to be educated about the new ideas and the technology that propels them.